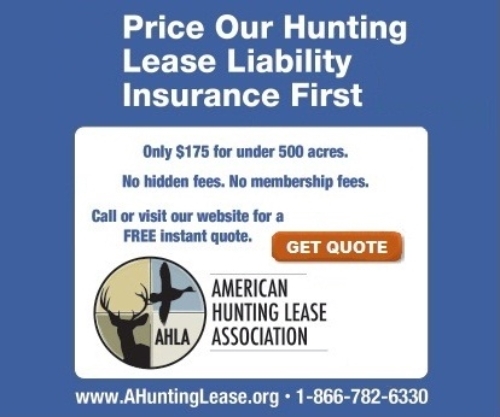 Hi, just a reminder that you're receiving this email because you expressed an interest in American Hunting Lease Association insurance and hunting related topics. Welcome to our new AHLA Newsletter! With a fresh new look we are committed to helping ensure that your hunting lease experience is as productive, safe and special as you want it to be. I don’t bowl. There are several reasons, but they pretty much begin and end with…shoe rental. Sliding my foot into a damp, smelly shoe that has been worn by hundreds of other “bowlers” doesn’t appeal to me at all. Same goes for tuxedos, golf clubs, limos and skis. They aren’t all bad, they just aren’t mine. It is absolutely no different when you rent a tree stand for a week. A quick check online finds hundreds of outfitters and companies that want to rent you a place to hunt for 3 or 5 days. See continuation of article. Basic necessities for whitetails are food, water and shelter. When buying and developing a hunting property, creating more food and bedding sanctuaries for attracting and holding deer are relatively inexpensive in comparison to the property's purchase price. Planting kill and recruitment food plots is just a matter of procuring the use of a tractor and learning the basics of farming. Thickening up the woods for protected bedding requires a chainsaw and requesting the advice of a USDA forester. Creating more and better water sources is without a doubt the most overlooked aspect of enhancing a property for whitetails. It's possible in one day's time for a good dozer operator to construct multiple small holding ponds on a property. See continuation of article. Uneven terrain, moving fast while remaining stealthy and carrying a loaded shotgun can all add up to one horrific accident. Combine those challenges with multiple hunters and no one in hunter orange and you can see that spring turkey hunting can be a dangerous endeavor. Before you leave the truck review the safest way to carry your weapon, check that the safety is on and make sure it is always pointing away from your partner. This is especially true when walking together down a trail or when that gobbler goes off and you need to make a quick move. Sometimes a simple reminder and frequent monitoring can make all the difference in the world. Make sure that everyone is on the same page and everyone is making safety a priority…before the hunt begins.